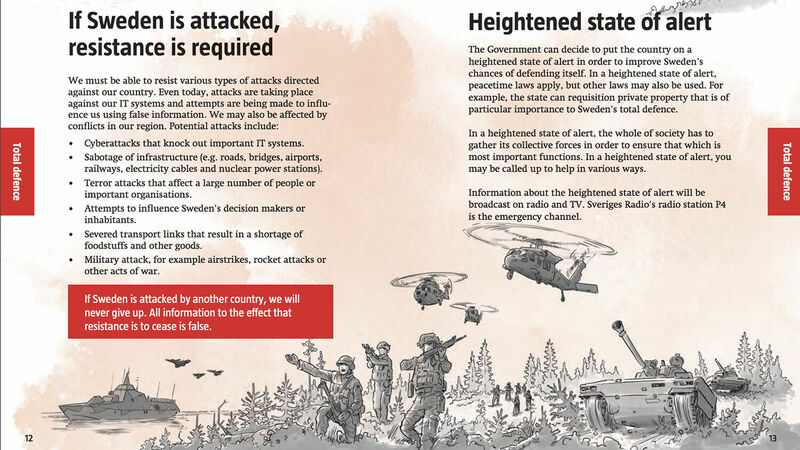 “If Sweden is attacked, resistance is required.” So reads one of the stark subheads in the Swedish government’s new leaflets, which were sent to all the nation’s households. The “If Crisis or War Comes” leaflet warns citizens about threats from global warming to terrorism to fake news. But a much bigger section warns citizens about their role in “total defense.” In the event of war, “everyone is obliged to contribute and everyone is needed,” it states. The leaflet also contains information about emergency alarms, air raid sirens and locations where citizens can take shelter from bombs. It also contains a checklist of goods that households should keep at home in preparation for a disaster. All this is a sober indication of the danger Sweden’s government sees in the current global condition. The nation issued similar leaflets in 1943 during World War ii. It continued to send out updated editions until 1961. Then from 1961 to 1991, it distributed the booklets to government offices. Now they are again being sent to everyone. This isn’t the only sign of increased preparations for war. The country is increasing its defense spending and discussing joining the North Atlantic Treaty Organization. And last year it brought back conscription. Many European countries are alarmed by Russia’s resurgence. The Trumpet has been watching this growing trend for over a decade. In his 2004 article “Russia Frightens Europe and Fulfills Bible Prophecy,” Trumpet editor in chief Gerald Flurry discussed the biblical significance of Russia’s rise and its effects on Europe. At the time, Mr. Flurry focused on the Russian elections and the consolidation of Vladimir Putin’s grip on power. After years of Russian economic and military growth, that warning is now more urgent than ever. Verse 44 states: “But tidings out of the east and out of the north shall trouble him [the king of the north] ….” This passage declares that in the end time, the very time we find ourselves in now, news from the northeast will cause Europe great alarm and anxiety. A map clearly shows that Russia lies northeast of Europe. But notice what is prophesied to happen next: “[T]herefore he shall go forth with great fury to destroy, and utterly make away many” (verse 44). There is a great war coming. Every time Europe anxiously prepares to defend itself against Russia is a step closer to this prophesied clash of powers. It is essential that we watch events in Europe with this prophecy in mind. Continue to watch for further anxiety in Europe to push its nations to rise to meet the threat of Russia. To learn more about this subject, request our free booklet The Prophesied ‘Prince of Russia,’ by Gerald Flurry.